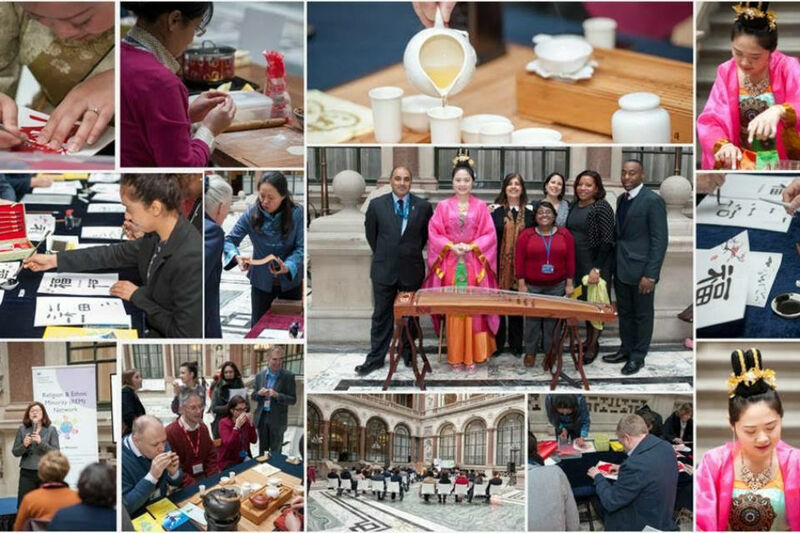 The Civil Service Race Forum cheered out the Chinese New Year with great splendour and vibrancy, in the lavish surroundings of the Foreign and Commonwealth Office on 23 February. "Confused by Confucius? Think you are a budding Buddha? Well I thought I could do with a spot of cultural enlightenment. So this year I went along to celebrate Chinese New Year ‘Year of the Monkey’ hosted by the DECC REM Network and Civil Service Race Forum, in the splendid surroundings of the Durbar Court at the Foreign and Commonwealth Office. We were treated to some live Chinese music while we tried our hand at a variety of traditional activities. The Chinese tea ceremony was very relaxing and made us realise that you should not really rush a good thing. Why not enjoy those delicate flavours and soothe away the troubles of a hectic day at office with a thimble of detoxifying green tea? If you want to cleanse your system with a smile, try a cup of hot water and think of China. My attempts to master the art of dumpling making got off to a bad start. But I think that, given a chance to practice, I could get the knack of that nip and tuck in the pastry which should produce a perfectly formed mini Cornish pasty – very nice with a drop of Tsingtao beer I am told. The art of calligraphy is obviously not as simple as it first seems. But as with most things: patience is a virtue. My favourite was of course the paper cutting. Painstakingly picking out the tiny squares of coloured sticky-backed paper with a toothpick, I discovered a surprising serenity in this activity. As a monkey appeared out of the chaos (it is the year of the monkey after all) I remembered those happy, care-free days doing arts and crafts at primary school. What a fun day out! Thank you to the CSRF and REM and MEAG Networks and all the volunteers who shared their cultural heritage with us. We should do this more often’. This was a Building Bridges Programme event, which aims to raise awareness of other cultures and faiths within the Civil Service. Events like this are important for us all. They remind us that the Civil Service itself and the nation we serve is made up of many different nationalities and cultures, that we should try to reflect and understand better so that we can better support these communities. We'd like to thank the FCO and DECC for putting on this lunchtime event to help all our staff engage with Chinese culture, it's a great example of how we're working to Champion Difference both in and outside of the Civil Service. I welcome this initiative to engage with and champion difference within and outside the Civil Service. It's well known that the Chinese place exceptional value on a strong work ethic and educational achievement as their attainments at secondary school and university would attest. A pool of talent for which the Civil Service might be keen to access through such events in the Building Bridges Programme, so one would think. But do civil servants of Chinese ethnicity experience similar disadvantage to other visible ethnic minorities? In today's Civil Service, networking and 'in-groups' with influence are the key to advancement rather than ability in many cases. During over 28 years in the Civil Service, most Chinese I've met have served in junior grades. I've only ever met two at Grade 7 (in scientific and economist disciplines). Never have I seen anyone of Chinese origin in the SCS, despite the irony of senior officials being called 'Mandarins' in the media. This lack of progression seems very odd, given that the Chinese have run some of the world's most dynamic economics, such as China, Hong Kong, Taiwan and Singapore.